Home Security Apps For iPhone: What Are My Options Here? The iPhone has always been known for its apps, so it’s no surprise that there are plenty of them for home security. Typically, these make it easy to see what’s going on in the secured area even when you are at a remote location. They do this by interfacing with your home security cameras. Some apps also allow your security system to contact you if it detects a problem. Here are a few of the apps that are currently considered the best. They work on the IOS operating system, which means that they will run on both iPhones and iPads. Some also have Android versions. Presence. This app lets you turn your old iPhones into security cameras. It has motion detection, captures video, and can send you notifications. The downside is that it can start up slowly, and only includes 50 MB of free cloud storage. Isentry. With Isentry, iPhone works with your computer to turn the home computer into a camera system. Just attach a webcam to the computer to capture video. You can then watch what’s going on within the cam’s viewing range by using the app. The app can also send you alarms. This app’s main downside is that the camera stops working if the computer goes into sleep mode. At Home. This app is much like Isentry. It is ranked slightly lower because it is said to start up slowly. Alarm.com. The alarm.com app works with a wide variety of home security systems. Many companies make their systems compatible with it so they don’t have to develop their own apps. Using your webcam as a home security system will allow strangers to see exactly what’s going on in your house if it is configured improperly. 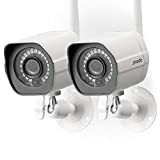 Always be sure to set up an effective password for these cameras, which are also known as IP cams. Your password ensures that you are the only one who can watch the action. App systems that use your old phones or a single webcam to see what’s going on can’t view everything. This means that a thief who comes in through an unmonitored area will go completely unnoticed until you get home and see that things are missing. If the criminal is someone who knows your house, it’ll be easy for him to avoid these types of security setups. Another crucial factor is that systems like this typically include no outside monitoring service like the SimpliSafe home security app . This makes it so that if you are not watching, nobody is. Even though there have been news stories of homeowners catching thieves using app-based remote viewing, there is a miniscule chance of actually being logged in at the exact time a thief is present in your home. Therefore, it’s far better to use apps that are provided by real home security services like ours. A proper security system includes all the equipment you need to monitor every possible way of entry. Each door, window, and any other opening big enough for someone to fit through must be covered. It also includes a secure way for your app to interface with it so that no one gets to see what they shouldn’t. Finally, it should connect to an outside monitoring service so that there is always someone who can respond to alarms right away. These services have entire staffs dedicated to monitoring, so your house doesn’t go unwatched if you’re busy or distracted. Here at Protect America, we offer affordable security system hardware and ongoing monitoring services that will truly protect your house without breaking your bank. We offer smartphone apps that work with our systems so that you can see what’s going on for yourself, but you never have to be tied to your phone in order to keep your house secure. To get a quote for our service, all you need to do is fill out the form on our site. We will get back to you in short order with a cost estimate and answer any questions you may have. Contact us today to get started.